It has been suggested that this article be merged with Breakfast at Tiffany's. (Discuss) Proposed since April 2019. Breakfast at Tiffany's is a 1961 American romantic comedy film directed by Blake Edwards and written by George Axelrod, loosely based on Truman Capote's 1958 novella of the same name. Starring Audrey Hepburn and George Peppard, and featuring Patricia Neal, Buddy Ebsen, Martin Balsam, and Mickey Rooney. The film was initially released on October 5, 1961 by Paramount Pictures. Hepburn's portrayal of Holly Golightly as the naïve, eccentric café society girl is generally considered to be one of the actress's most memorable and identifiable roles. Hepburn regarded it as one of her most challenging roles, since she was an introvert required to play an extrovert. Early one morning, a taxi pulls up in front of Tiffany & Co. and from it emerges elegantly dressed Holly Golightly, carrying a paper bag containing her breakfast. After looking into its windows, she strolls to her apartment and has to fend off her date from the night before. Once inside, Holly can't find her keys so she buzzes her landlord, Mr. Yunioshi, to let her in. Later, she is awakened by new neighbor Paul Varjak, who rings her doorbell to get into the building. The pair chat as she dresses to leave for her weekly visit to Sally Tomato, a mobster incarcerated at Sing Sing. Tomato's lawyer pays her $100 a week ($850 today) to deliver "the weather report". As she is leaving, Holly is introduced to Paul's "decorator", wealthy older woman Emily Eustace Failenson, whom Paul nicknames "2E". That night, when Holly goes out onto the fire escape to elude an over-eager date, she peeks into Paul's apartment and sees 2E leaving money and kissing him goodbye. Holly visits Paul later and learns he is a writer who has not had anything published since a book of vignettes five years before. Holly, in turn, explains she is trying to save money to support her brother Fred. The pair fall asleep, but are awakened when Holly has a nightmare about her brother. When Paul questions her about this, Holly chides him for prying. She later buys Paul a typewriter ribbon to apologize and invites him to a wild party at her apartment. There, Paul meets her Hollywood agent, who describes Holly's transformation from country girl into Manhattan socialite. He is also introduced to José da Silva Pereira, a wealthy Brazilian politician, and Rusty Trawler, the "ninth richest man in America under 50". The next day, 2E enters Paul's apartment, worried she is being followed. Paul tells her he will investigate and eventually confronts Doc Golightly, Holly's estranged husband. Doc explains that Holly's real name is Lula Mae Barnes and that they were married when she was 14. Now he wants to take her back to rural Texas. After Paul reunites Holly and Doc, she informs Paul that the marriage was annulled. At the Greyhound bus station, she tells Doc she will not return with him, and he leaves broken-hearted. After drinking at a club, Paul and Holly return to her apartment, where she drunkenly tells him that she plans to marry Trawler for his money. A few days later, Paul learns that one of his short stories will be published. On the way to tell Holly, he sees a newspaper headline stating that Trawler has married someone else. Holly and Paul agree to spend the day together, taking turns doing things each has never done before. At Tiffany's, Paul has the ring from Doc Golightly's box of Cracker Jack engraved as a present for Holly. After spending the night together, he awakens to find her gone. When 2E arrives, Paul ends their relationship. She calmly accepts, having earlier concluded that he was in love with someone else. Holly now schemes to marry José for his money, but after she receives a telegram notifying her of her brother’s death she trashes her apartment. Months later, Paul is invited to dinner by Holly, who is leaving the next morning for Brazil to continue her relationship with José. However, they are arrested in connection with Sally Tomato's drug ring, and Holly spends the night in jail. The next morning, Holly is released on bail. Paul is waiting for her in a cab, bringing her cat and a letter from José explaining that he must end their relationship due to her arrest. Holly insists that she will go to Brazil anyway; she asks the cab to pull over and releases the cat into the pouring rain. Paul then storms out of the cab, tossing the engraved ring into her lap and telling her to examine her life. She goes through a decision making moment, puts on the ring and runs after Paul, who has gone looking for the cat. Finally Holly finds it sheltering in an alley and, with it tucked into her coat, she and Paul embrace. George Peppard as Paul Varjak (nicknamed "Fred" by Holly, for his resemblance to her brother) - Writer - New neighbor and kept man of "2E"
The Oscar-nominated screenplay was written by George Axelrod, loosely based on the novella by Truman Capote. Changes were made to fit the medium of cinema and to correspond to the filmmakers' vision. Capote, who sold the film rights of his novella to Paramount Studios, wanted Marilyn Monroe to play Holly Golightly, whom he had described perfectly in the book. Barry Paris cites Capote's own comments on the choice of actress: "Marilyn was always my first choice to play the girl, Holly Golightly." Screenwriter Axelrod was hired to "tailor the screenplay for Monroe". When Lee Strasberg advised Monroe that playing a "lady of the evening" would be bad for her image, she turned it down and performed in The Misfits instead. When Hepburn was cast instead of Monroe, Capote remarked: "Paramount double-crossed me in every way and cast Audrey". Shirley MacLaine was also offered the part of Holly, but she turned it down and performed in Two Loves instead. Originally producers Martin Jurow and Richard Shepherd had picked John Frankenheimer as the director, but Hepburn said: "I've never heard of him" and he was replaced on her request. Hepburn in the opening scene. Filming began on Fifth Avenue outside Tiffany & Co. on October 2, 1960. Most of the exteriors were filmed in New York City, except the fire escape scenes and the alley scene at the end in the rain where Holly puts Cat out of the cab and then Paul and Holly look for Cat. All of the interiors, except for portions of the scene inside Tiffany & Company, were filmed on the Paramount Studios lot in Hollywood. According to one report, the film's on-location opening sequence, in which Holly gazes into a Tiffany's display window, was extremely difficult for director Blake Edwards to shoot. Although it was simple in concept, crowd control, Hepburn's dislike of pastries, and an accident that nearly resulted in the electrocution of a crew member are all said to have made capturing the scene a challenge. However, another report claims that the sequence was captured rather quickly due to the good fortune of an unexpected traffic lull. It took me a long time to figure out what Holly Golightly was all about. One night after midnight I was still trying. I don't drink much, but I was sipping. And it came to me. I wrote ["Moon River"] in half an hour. During the film, Hepburn sang the film's signature song, "Moon River" by Henry Mancini and Johnny Mercer. The song was tailored to Hepburn's limited vocal range, based on songs she had performed in 1957's Funny Face. On the Anniversary Edition DVD of Breakfast at Tiffany's co-producer Richard Shepherd says in his audio commentary that after a preview in San Francisco, Martin Rankin, Paramount's head of production, wanted "Moon River" replaced with music by somebody like Gordon Jenkins (whose album Manhattan Tower had been out fairly recently): "Marty [Jurow, co-producer] and I both said 'over our dead bodies.'" According to Mancini and Edwards, a studio executive hated the song and demanded it be cut from the film; Hepburn, who was present, responded to the suggestion by standing up and saying, "Over my dead body!" According to Time magazine, Mancini "sets off his melodies with a walking bass, extends them with choral and string variations, varies them with the brisk sounds of combo jazz. 'Moon River' is sobbed by a plaintive harmonica, repeated by strings, hummed and then sung by the chorus, finally resolved with the harmonica again." Breakfast at Tiffany's set Hepburn on her 60s Hollywood course. Holly Golightly, small-town Southern girl turned Manhattan trickster, was the naughty American cousin of Eliza Doolittle, Cockney flower girl turned My Fair Lady. Holly was also the prototype for the Hepburn women in Charade, Paris When It Sizzles, and How to Steal a Million: kooks in capers. And she prepared audiences for the ground-level anxieties that Hepburn characters endured in The Children's Hour, Two for the Road and Wait Until Dark. as implausible as ever. But in the person of Miss Hepburn, she is a genuinely charming, elfin waif who will be believed and adored when seen. George Peppard is casual and, for the most part, a subdued citizen who seems to like observing better than participating in the proceedings. Martin Balsam makes a properly brash, snappy Hollywood agent. Mickey Rooney's bucktoothed, myopic Japanese is broadly exotic. Patricia Neal is simply cool and brisk in her few appearances as Mr. Peppard's sponsor and Vilallonga, is properly suave and Continental as Miss Hepburn's Brazilian, while Buddy Ebsen has a brief poignant moment as Miss Hepburn's husband. Truman Capote hated Hepburn in the lead part. Capote biographer Gerald Clarke deemed the film a "valentine" to free-spirited women rather than a cautionary tale about a little girl lost in the big city. "The movie is a confection — a sugar and spice confection." Review aggregation website Rotten Tomatoes retrospectively collected reviews from 50 critics and gives the film a rating of 88%, with an average rating of 7.4/10. The site's consensus states: "It contains some ugly anachronisms, but Blake Edwards is at his funniest in this iconic classic, and Audrey Hepburn absolutely lights up the screen." Hepburn as Holly, with her hair in a high chignon and carrying an oversized cigarette holder, is considered one of the most iconic images of 20th century American cinema. Another iconic item throughout the movie is Holly's sunglasses. Often misidentified as Ray-Ban, they are Manhattan sunglasses designed and manufactured in London by Oliver Goldsmith. In 2011 the model was re-released to mark the 50th anniversary of Breakfast at Tiffany's. One of three dresses designed by Givenchy for Hepburn for possible use in the film sold at auction by Christie's on December 5, 2006 for £467,200 (~US$947,000), about seven times the reserve price. The "Little Black Dress" by Givenchy, worn by Hepburn in the beginning of the film, is cited as one of the most iconic items of clothing in the history of the twentieth century and is, perhaps, the most famous little black dress of all time. A second "little black dress" in Breakfast at Tiffany's, along with its wide-brimmed hat, was worn by Hepburn as Holly when she goes to visit mobster Sally Tomato at Sing Sing Prison. This dress was paid homage as one of the dresses worn by Anne Hathaway's character Selina Kyle, Catwoman's alter ego, in Christopher Nolan's The Dark Knight Rises; the comic book Catwoman character was originally drawn based on Hepburn, according to Catwoman comic cover artist Adam Hughes, creating a double homage to Hepburn's Holly Golightly in Hathaway's Catwoman. The film rejuvenated the career of 1930s movie song-and-dance man and Disney Davy Crockett sidekick Buddy Ebsen, who had a small but effective role in this film as Doc Golightly, Holly's ex-husband. His success here led directly to his best-known role as Jed Clampett on The Beverly Hillbillies. A diamond necklace at Tiffany's that Hepburn scorned as too flashy, was the Tiffany Yellow Diamond, which she wore in publicity photos for the film. Tiffany's profile, while already established as a pre-eminent luxury retailer, was further boosted by the film. 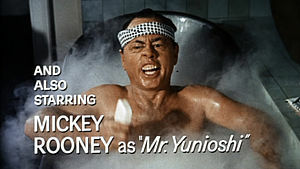 For his portrayal of I. Y. Yunioshi, Mickey Rooney wore makeup and a prosthetic mouthpiece to change his features to a caricatured approximation of a Japanese person. Since the 1990s, this portrayal has been subject to increasing protest by Asian Americans, among others. For instance, in the film Dragon: The Bruce Lee Story (1993), Breakfast at Tiffany's is used as an illustration of Hollywood's racist depiction of Asian people when Bruce Lee and his future wife, Linda, see the film and Linda suggests they leave when she notices that Bruce is upset at Rooney's caricatured performance. In his audio commentary for the DVD release, producer Richard Shepherd said that at the time of production as well as in retrospect, he wanted to recast the role "not because he [Rooney] didn't play the part well" but because Shepherd thought the part of Mr. Yunioshi should be performed by an actor of Japanese ethnicity; it was director Blake Edwards' decision to keep Rooney. In a "making-of" for the 45th anniversary edition DVD release, Shepherd repeatedly apologizes, saying, "If we could just change Mickey Rooney, I'd be thrilled with the movie." Director Blake Edwards stated, "Looking back, I wish I had never done it ... and I would give anything to be able to recast it, but it's there, and onward and upward." Blake Edwards ... wanted me to do it because he was a comedy director. They hired me to do this overboard, and we had fun doing it ... Never in all the more than 40 years after we made it – not one complaint. Every place I've gone in the world people say, "God, you were so funny." Asians and Chinese come up to me and say, "Mickey you were out of this world." Rooney also said that if he had known the portrayal would be offensive, "I wouldn't have done it. Those that didn't like it, I forgive them and God bless America, God bless the universe, God bless Japanese, Chinese, Indians, all of them and let's have peace." The film continues to draw criticism for this character, now widely considered to be a racist caricature, particularly when the movie is selected as a "classic" screened in public spaces, supported by tax dollars. In 2011, a SyFy and Brooklyn Bridge Park Corporation screening inspired petitions. Henry Mancini won the Grammy Award for Best Soundtrack Album or Recording or Score. George Axelrod won the Writers Guild of America, East for Best Written American Drama. Blake Edwards was nominated for the Directors Guild of America Award for Outstanding Directorial Achievement in Motion Pictures. Orangey the cat won the 1962 PATSY Award of the American Humane Association for his portrayal of "the poor slob without a name". The film was ranked #486 on Empire's The 500 Greatest Movies of All Time list for 2008. American Film Institute ranked the film #61 in 100 Years ... 100 Passions and "Moon River" as #4 in 100 Years ... 100 Songs. The soundtrack featured a score composed and conducted by Henry Mancini, with songs by Mancini and lyricist Johnny Mercer. Mancini and Mercer won the 1961 Oscar for Best Original Song for "Moon River". Mancini won for Best Original Score. There are also unreleased score pieces from Breakfast at Tiffany's in existence; "Carousel Cue" is from an unsurfaced scene, while "Outtake 1" is from a deleted scene in which Holly and Fred visit Tiffany's and is a variation of the main theme. In 2013 Intrada released the complete score in its original film performance (as with many soundtrack albums by Mancini and others at the time, the album released alongside the film was a re-recording). Breakfast at Tiffany's: The Making of a Classic – a making-of featurette with interviews by Edwards, Neal, the "laughing/crying" woman from the party, and Sean Ferrer, Hepburn's son. It's So Audrey! A Style Icon – a short tribute to Hepburn. Brilliance in a Blue Box – a brief history of Tiffany & Co.
Audrey's Letter to Tiffany – an accounting of Hepburn's letter to Tiffany & Co. on the occasion of the company's 150th anniversary in 1987. A Golightly Gathering – Reuniting some of the past cast members from the party with interviews on their experiences filming that segment. Henry Mancini: More Than Music – A featurette about Henry Mancini, "Moon River" and interviews with Mancini's wife and children. Mr. Yunioshi: An Asian Perspective – Documentary discussing the reaction and Asian perspective of the character of Mr. Yunioshi, one of the most controversial characters in film. In 2011 a newly remastered HD version of the film was released on Blu-ray with many of the features from the aforementioned DVDs. The digital restoration of the film was done by Paramount Pictures. The digital pictures were frame by frame digitally restored at Prasad Corporation to remove dirt, tears, scratches and other artifacts. The film was restored to its original look for its 50th Anniversary. In 1966, David Merrick produced a Broadway musical of the same name starring Mary Tyler Moore as Holly Golightly and Richard Chamberlain as Paul. The troubled production closed after four previews. In 2004, a new musical adaptation of the film made its world debut at The Muny in St. Louis. In May 2009, actress Anna Friel confirmed that she would star in a West End adaptation of the film. The show opened in September 2009 at the Haymarket Theatre. A new stage adaption made its debut in March 2013 at the Cort Theater in New York City. The role of Holly Golightly was played by Emilia Clarke. ^ "Breakfast at Tiffany's (PG)". British Board of Film Classification. January 8, 2001. Retrieved August 1, 2016. ^ a b Spoto 2006, pp. 204–05. ^ Paris, Barry (1996). Audrey Hepburn. Berkley Books. ISBN 978-0399140563. ^ Foerster, Jonathan (February 9, 2011). "Shirley MacLaine isn't getting old, she's just advanced". Naples Daily News. Retrieved June 27, 2017. ^ Honan, Corinna (November 4, 2010). "Tantrums at Tiffany's: How a viper's nest of clashing egos nearly killed off one of the best-loved films ever made". Daily Mail. Retrieved March 12, 2018. ^ Gristwood, Sarah (September 30, 2010). ""Breakfast at Tiffany's: 50 Years On"". The Telegraph. ^ a b "Movies: Never Too Much Music". Time. May 25, 1962. Retrieved October 3, 2010. ^ Shepherd, Richard. Breakfast at Tiffany's – Anniversary Edition/Centennial Edition audio commentary (DVD). Paramount. Event occurs at 25:20. ^ Erwin, Ellen; Diamond, Jessica Z. (October 2006). The Audrey Hepburn Treasures. New York: Atria Books. p. 107. ISBN 978-0-7432-8986-3. ^ "Cinema: Once Over Golightly". Time. October 20, 1961. Retrieved October 3, 2010. ^ Corliss, Richard (January 20, 2007). "Audrey Hepburn: Still the Fairest Lady". Time. Retrieved October 3, 2010. ^ Weiler, A.H. (October 6, 1961). "The Screen: Breakfast at Tiffany's: Audrey Hepburn Stars in Music Hall Comedy". The New York Times. Retrieved October 3, 2010. ^ "Capote never liked Hepburn in iconic role". Today.com. Associated Press. Retrieved November 10, 2014. ^ Spoto 2006, p. 203. ^ Moss, Rob (July 28, 2011). "Re-released Manhattan sunglasses mark 50th anniversary of Breakfast at Tiffany's". Eye Wear Glasses. Retrieved April 19, 2016. ^ "Audrey Hepburn Breakfast At Tiffany's, 1961". Christie's. December 5, 2006. Retrieved April 19, 2016. ^ "Auction frenzy over Hepburn dress". BBC NEWS. December 5, 2006. ^ "The Most Famous Dresses Ever". Glamour.com. April 2007. Retrieved May 16, 2011. ^ "Audrey Hepburn dress". Hello Magazine. December 6, 2006. ^ "Audrey Hepburn's little black dress tops fashion list". The Independent. May 17, 2010. Retrieved May 16, 2011. ^ Steele, Valerie (November 9, 2010). The Berg Companion to Fashion. Berg Publishers. p. 483. ISBN 978-1-84788-592-0. Retrieved May 16, 2011. ^ Miller, Jacqui (2014). Fan Phenomena: Audrey Hepburn. Chicago: University of Chicago Press. pp. 26–7. ISBN 978-1-78320-206-5. ^ "#204: Tiffany & Co. and its priceless Yellow Diamond - 1000 Things to do New York". October 1, 2014. ^ Shepherd, Richard. Breakfast at Tiffany's – Anniversary Edition/Centennial Edition audio commentary (DVD). Paramount. Event occurs at 3:43. ^ a b Magagnini, Stephen (September 28, 2008). "Mickey Rooney upset about claims his 'Tiffany's' role is racist". Sacramento Bee. Scripps Howard News Service. Archived from the original on December 5, 2008. Retrieved October 3, 2010. ^ "'Breakfast At Tiffany's' Brooklyn Screening Sparks Protests From Asian-American Group". July 13, 2011 – via Huff Post. ^ "NY Times: Breakfast at Tiffany's". NY Times. Retrieved December 24, 2008. ^ "Empire: Features". Empireonline.com. Retrieved May 16, 2009. ^ "Breakfast at Tiffany's Blu-ray". ^ "Latest Academy News". September 10, 2014. ^ "Show Archives". The Muny. Archived from the original on May 28, 2008. Retrieved May 16, 2009. ^ "Entertainment | West End Breakfast for Anna Friel". BBC News. May 15, 2009. Retrieved May 16, 2009. ^ "Breakfast At Tiffany's—The Official Broadway Site". Retrieved April 12, 2013. Spoto, Donald (2006). Enchantment: The Life of Audrey Hepburn. New York: Harmony Books. ISBN 0-307-23758-3.